One sunny and hot day afternoon, do you remember the experience looking at the sky under the tree taking a little break? Tree leaves layered with intermingling branches shows the diverse greanness including sunlight behind them. And the sunlight piercing through those leaves and branches is so strong that evey with closed eye I can feel its origin. I think that the light in moving images, especially the image with projection light very much take after the light in nature. The principle of moving images representing their individual color using Red, Green, Blue is also very similar to the one for addtive process representing color in nature. Therefore, although the light represented im media is artifically created light, it can express the nature light. 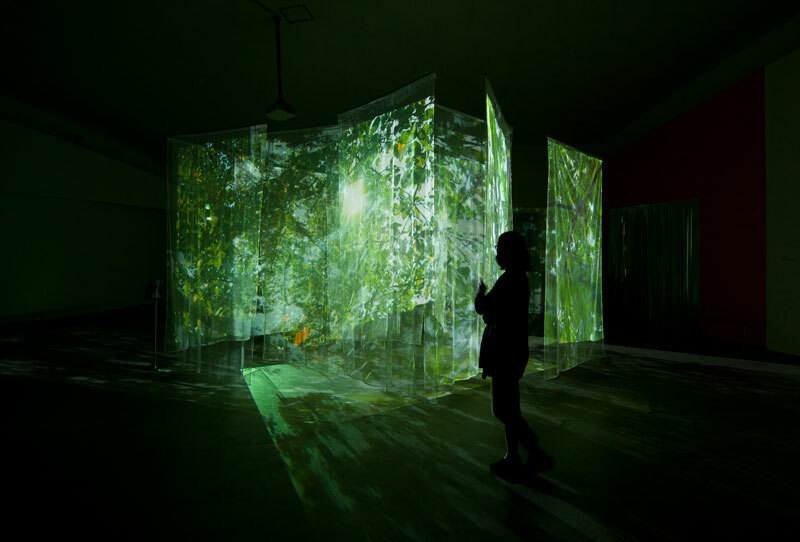 This multi-channel video projection installation is to think of the greeness of nature and the light in-between those greens and therefore, our bodies can perceptually experience the nature and the source of light in its media experience. 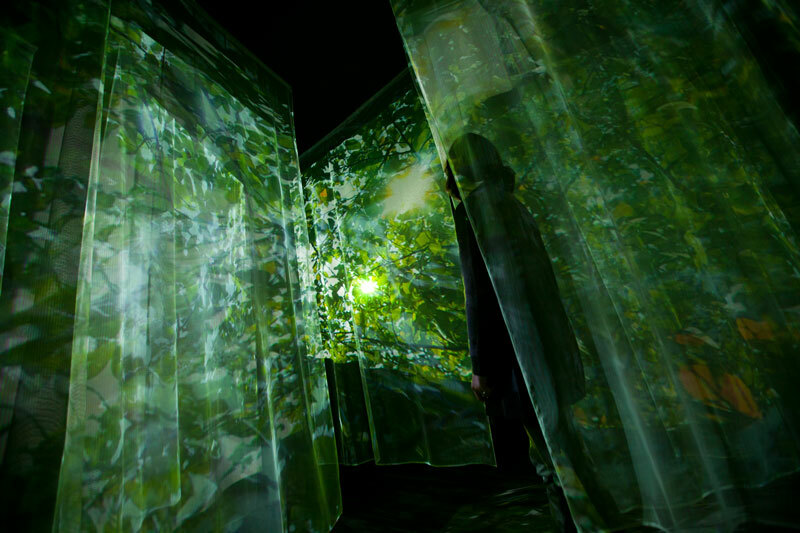 Technically this project uses multi-channel projections to make a kind of space to explore with layers of screen. 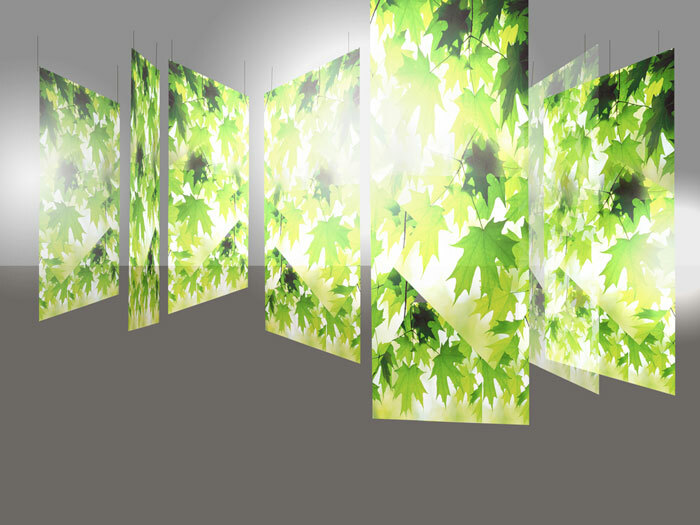 Screen material is semi-transparent so that it becomes a display screen simultaneously revealing the scene behind and beyond. 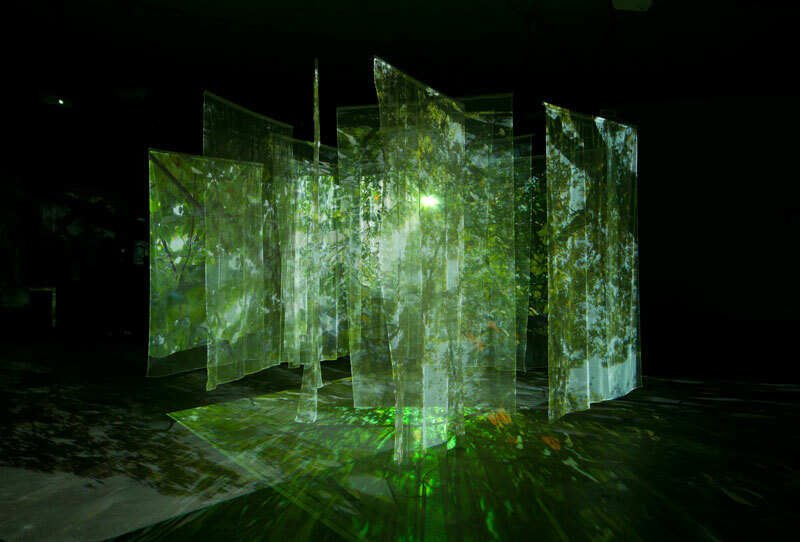 In this installation, I hang each projectors little bit lower than the usaual projector display setting, so that they reveal thier projection light source directly to the viewers, although it is revealed through the screen. 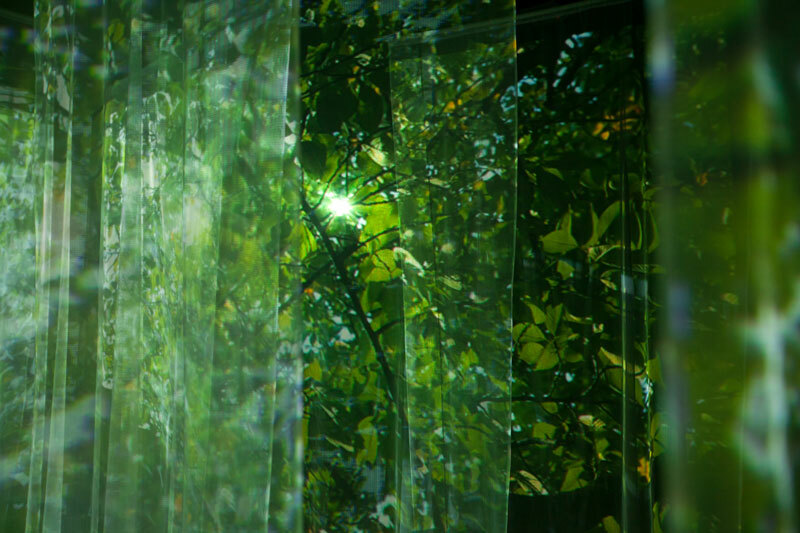 With the shining sun in the video images, the physical shining projection light doubles the experience of light. 어느 뜨거운 여름 오후 잠시 나무 그늘 아래서 하늘을 바라본 경험을 기억할 수 있을까. 드리워진 나뭇가지들로 인해 겹겹이 쌓여진 나뭇잎들은 빛을 머금고 한없는 초록의 다채로움을 보여준다. 또한 그 사이로 스며드는 또는 그 사이를 꿰뚫고 들어오는 강렬한 빛은 눈감아도 그 근원을 찾을 수 있을 만큼 강렬하다. 영상의 빛, 특히 영상 프로젝터의 광원은 이러한 자연의 햇빛과 매우 닮아있다. RGB가 만들어 내는 가산혼합은 이런 자연이 만드는 빛의 원리와 닮아있으며 그 때문에 인공의 빛이라 할지라도 가장 자연의 빛을 잘 표현할 수 있다. 본 작업은 이러한 나뭇잎 층들이 만들어내는 녹음과 그 사이의 빛에 대한 우리 신체의 감각적 경험을 여러 레이어로 이루어진 영상 스크린과 프로젝터의 광원을 통해 공간 안에 추상적으로 접근해 보고자 한다. Light Green Leaves with Light on Vimeo.